By Charlotte Nuessle, B.Sc. and Will Nuessle, Ph.D. Various Schools of Yoga are available here on every island in Hawai'i. Because of dedicated practitioners who have pursued study and application over many years, the traditions themselves continue to evolve to be appropriate for our lives today. Ashtanga- Ashta means Eight. This is the 8-limbed path which includes asana and pranayama. Ashtanga Yoga often refers to the name given to the system of yoga taught by Sri K. Pattabhi Jois at the Ashtanga Yoga Research Institute in Mysore, India. This method of yoga involves synchronizing the breath with progressive series of posture. Ashtanga classes may also be called Power Yoga. A power workout of established sequences that includes jumping from one strong pose to another, practicing breath control. Bikram (Hot Yoga) A sequence of 26 postures designed to stretch the muscles in a certain order, performed in a room heated to 100 degrees or more. Iyengar Concentrates on aligning the body, using props as necessary to achieve precision of a particular form or asana. Kripalu Focuses on physical and psychological reactions to various poses in three stages  in what culminates in a kind of meditation in motion. Pre-natal Yoga classes offer modifications of yoga postures to support the physiological changes during pregnancy. A great place to nurture and prepare your body for childbirth as well as bond with women during a special time of life. Sivananda A rigorous application of yoga poses, breathing exercises, relaxation. Can include vegetarian diet and study of scriptures. 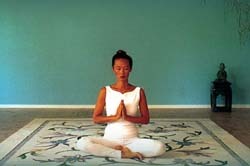 Charlotte Nuessle was certified as a Kripalu Yoga teacher in 1980. She is now studying and teaching in the Viniyoga tradition. Charlotte offers classes, private instruction, wellness coaching and retreats, and workshops on O�ahu. For more information, see her listing in Hawaii Health Guide.com or call 808-230-8902. Will Nuessle is a licensed clinical psychologist with the Hawaii Counseling and Education Center, Kailua, O�ahu. A 30-year Yoga practitioner, Will incorporates the heart of yoga philosophy in his psychotherapy practice, offering private work and intensive retreats. He can be reached at 808-254-6484.